← Best Week 2014, Staff Mutiny! Set at the dawn of the 20th century in the contested borderlands where the Mexican states of Sonora and Chihuahua meet the most recent acquisition of the United States, the Gadsden Purchase, Pax Porfiriana is a thing of savage beauty. As a powerful hacendado living during the iron rule of Porfirio Diaz, you’re influential to the point that the law is a mere gadfly to be shooed away at your leisure — imprisonment, for instance, means you simply conduct your business from jail, or more likely just bribe your way out as easily as you might hire a few gunhands to put down a strike. You’re wealthy enough to buy banks and ranches with some regularity. Amoral enough to make use of illegal Yaqui slave labor or assassinate anyone who aligns with your opponents. Powerful enough that the only possible goal is the accumulation of more power. It’s telling that each of the starting hacendado cards tells you exactly how your historical alter ego kicked it, and only one died of old age. The others? Spoiler alert, they were shot. But it’s not enough that Pax Porfiriana merely be set in this picante-flavored world. More than that, this theme, of selfish men doing selfish deeds, completely shows in the gameplay. Let’s look at some examples. As a gun runner, Bernardo Reyes thrives on chaos. At its heart, Pax Porfiriana is a tableau builder. Centered around a rolling market in the middle of the table, there’s a constant string of opportunities to take advantage of. The simplest are called enterprises, businesses like ranches, banks, mines, and gun stores. These can often be upgraded, even by other players looking for piece of your pie, and are usually your main sources of income, though it’s entirely possible to profit in other ways. The other centerpieces of the market are troops, who can extort the aforementioned enterprises or protect your own interests (or eventually become your own personal army), and partners, who bring all sorts of advantages. Want to ally with William Randolph Hearst to manipulate public opinion? Or gather “surplus” weapons from better-equipped U.S. cavalry? Or cut a deal with Henry Ford for Model T trucks to move your troops around on the cheap? Or, hell, bribe the entire Mexican Supreme Court in exchange for extralegal status? But it’s more complicated than just assembling a strong tableau of businesses, troops, and partners, because there are all sorts of ways to play your cards off each other to attain better results or undermine your opposition. For instance, in one recent game, my most powerful opponent had built a financial empire to rival Diaz himself. He had not only purchased immense ranches, but also stakes in everyone else’s enterprises. And he was clever enough to defend his interests with loads of troops and a personal general to see to their training. My first attempt at weakening his position bounced right off, though it was sound in principle. Basically, I built a gun store and then hired bandits to raid his territory. The regional chaos meant more people bought guns for personal security, profiting me greatly. Unfortunately, my opponent’s troops were able to clear out the unrest on his enterprises with hardly any effort. While I’d made a lot of money, I hadn’t done anything to chip at my enemy’s armor. Instead, I went legal — though under Porfirio Diaz’s regime, “legal” has its own unique meaning. In this case, I arrested his general (who was tragically shot while attempting to escape), had the Porfirian commission declare his best ranch unfairly priced and hand it off to me instead, and seized his Mormon-controlled shipping in my territory. Within one turn, I halved his income and opened the floodgates for his enemies to march their troops across his holdings. And that’s how a hacendado gets it done. 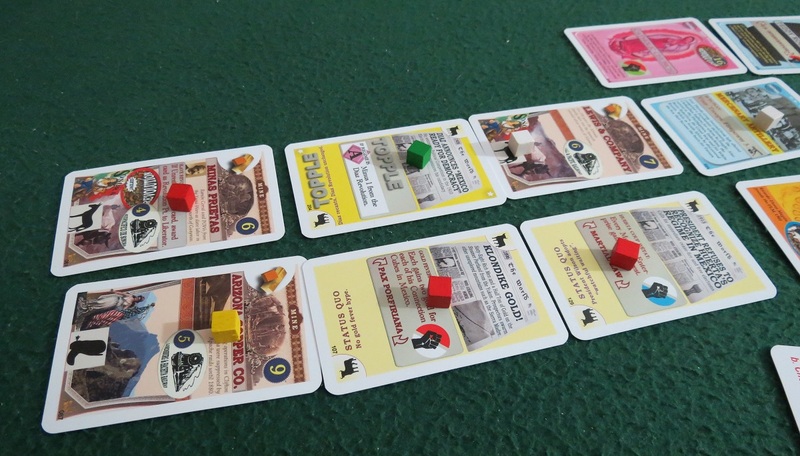 Winning is a tricky prospect in Pax Porfiriana, and not only because everyone is out to get you. Sure, you could save up a lot of money and hope the game ends sooner rather than later (in a tie the winner is determined by cold hard pesos), but it’s more likely that someone will try and topple Diaz’s regime long before then. Toppling El Presidente comes down to a combination of factors, not the least of which is the way you’d like him to fall. It’s possible to foment a socialist revolution, set up your own rogue state in the north, persuade the United States to come down and annex you, or go the pleasant route by just talking Diaz into naming you his successor. But no matter which route you choose, timing is everything; you’ll need a whole lot of prestige in your chosen field (nobody’s going to join your revolution if you aren’t known as a revolutionary, for instance), not to mention swing the prevalent regime into your favor at the exact moment that a “topple” card becomes available in the market. It’s a difficult sequence of events — though hardly impossible if you go into your coup with a long-term plan. Let’s back up a bit. First of all, when something bad happens — say, a horde of bandits robs someone’s bank — you often flip the offending card upside down and “victim award” it to the player that was harmed. Now that player is “outraged,” upset that Diaz didn’t police his country better and thus more likely to support a U.S. bid for takeover. Or maybe one of your enterprises is nationalized and you suddenly discover you have anti-government leanings. Stuff like that. Here’s the neat bit: you can pull a “straw man” to play those cards on yourself. As in, you can fake a bandit raid, and then stomp around about how pissed off you are about that ineffectual Diaz regime. Or talk the government into nationalizing one of your enterprises — something paltry, say — and then bluster on about Marx and all that. So, in that very same recent game, all my bandit attacks and lawsuits had suddenly turned my rival into a very sympathetic figure. And it only got worse when he started using Yaqui slave labor at a local mine, only to foment an uprising on his own land, “overthrowing” the “capitalists,” et cetera, et cetera. The hordes of adoring revolutionaries had no idea their deposed overseer and their newfound liberator were one and the same. His new status as a socialist figurehead was entirely engineered — and completely likely to win the game very soon. There’s this Spanish word I’ve always loved, an idiomatic expression that lacks a direct translation. That word is hipocresía. And it’s one of the best ways to win Pax Porfiriana. Don Luis Terrazas considers himself a patron of the arts and education. Well, I wasn’t going down without a fight. And I certainly wasn’t going to let a Marxist, real or otherwise, take over my country. No sir. Nothing for it but to plunge the entire country into a depression. It took some careful manipulation of the market, but once the damage was done, nearly every enterprise on the table was worth nothing. Less than nothing, actually, since a depression means you suddenly have to pay upkeep on everything. Those of us with meager holdings suffered the least, our savings lasting long enough to set up economy-proof businesses, while the big fish — like my rival — suddenly found themselves without the funds necessary to topple Porfirio Diaz. Aw. Maybe next time. Unless, perhaps, I was then able to win in some other way. Maybe I could get Porfirio Diaz to see just how loyal I was, or amass a fortune of my own. Because that’s how Pax Porfiriana plays, your greedy fingers always within reach of victory, only to have it plucked from your grasp time after time. 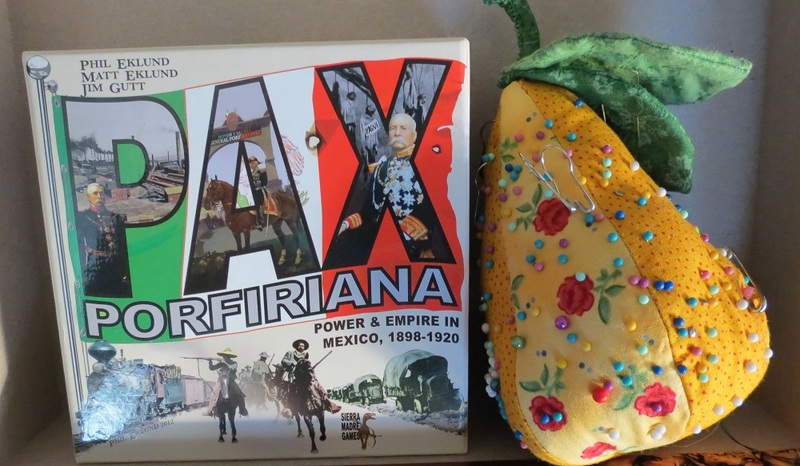 I’m not exaggerating when I say that Pax Porfiriana is one of my favorite games. 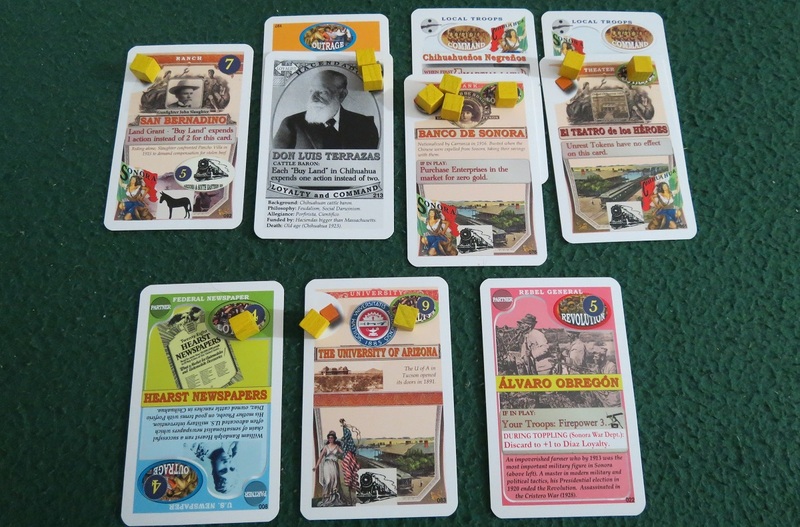 It comes with tons of cards, every one of them unique, brimming with history and ways to nettle your opponents — or yourself, just so you can fabricate an excuse to bribe Teddy Roosevelt into invading Sonora. Or manipulate the Catholic Church into supporting your private regime. Or build such a huge army that nobody can do anything but watch as you transform Chihuahua into the Private Empire of Bernardo Reyes. Or… well, there are quite a few cards, and you only see somewhere between a quarter to a half of them in any given game, so there’s an incredible amount of replay value packed into this microscopic box. Stuffed right alongside the impeccably cruel gameplay, as it so happens. It isn’t for the faint of heart. 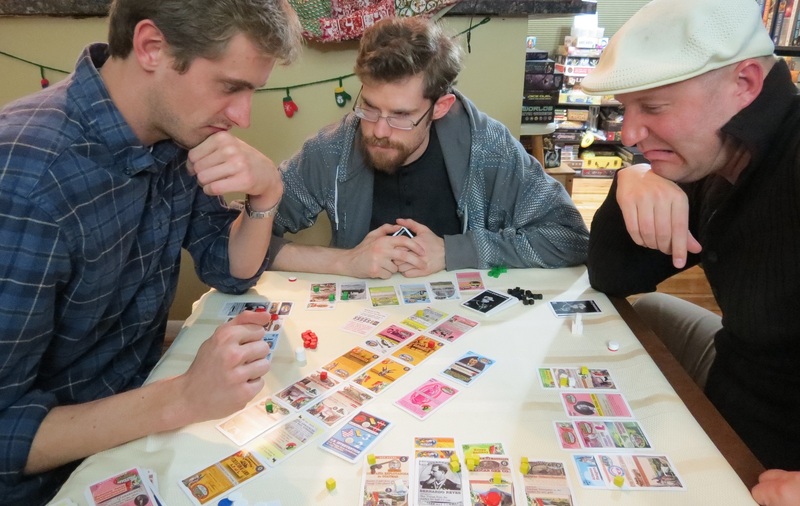 Not only is it a mean game, occasionally getting even my normally level-headed group of friends prickly towards each other, but it’s also not particularly well documented, with lots of little rules and special circumstances to learn. I don’t usually do learning games, because those are for children and invertebrates. Pax Porfiriana is the exception. But if you’ve got the heart and the guts, Pax Porfiriana pays out in spades. It’s soaked through with malice, brains, and a whole stinking bottle of mescal. And that’s totally a good thing. 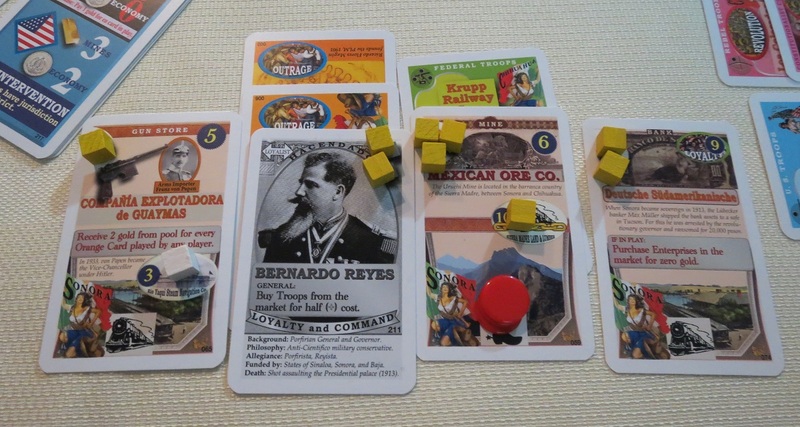 Posted on January 15, 2015, in Board Game and tagged Board Games, Pax Porfiriana, Phil Eklund, Sierra Madre Games. Bookmark the permalink. 25 Comments. Welcome back from your break! It was nice to have a quality review to read again. I haven’t played Pax yet, but I’m becoming more and more tempted. Me too! Though I think I’ll talk to my hombres and see if they’d be interested in playing before I drop the cash. I have yet to play a game from Phil Eklund, but I’ve been sorely tempted to investigate his work. Sadly, as much as I’d love to, it’s sort of hard to find a copy of Pax Porfiriana these days. Any chance you’ll write a review of Greenland? That’s the plan. Though I need to get through its oddly difficult rulebook first. Great review! This is exactly how I feel when I play. While the first time can be a little slow, when the mechanics really clicks it’s an amazing game – certainly one of the most thematic and immersive games in my collection. I’m a great fan of Phil Eklund and his games. Although High Frontier is my favourite game of his (my review: http://firebroadside.blogspot.se/2013/11/review-of-high-frontier-and-colonization.html) but Pax is not far behind. The thing that I find so fascinating with his games is the strict adherence to the simulation mindset. While things can be tweaked here and there to make for a better play experience, the historical (or physical) facts are what they are and he sticks to them. For example, I joined him in a playtest game of Greenland last year and when another player suggested limiting the amount of Energy (lumber in this case) you could get from Vinland per turn since that would make the game more balanced, his answer was “well, for all practical purposes the lumber supply at this time was infinite”. And that was that – if the game needed balancing it would have to be in some other area, because changing a fact like was out of the question. Looking forward to your thoughts on Greenland as well. Although it looks superficially similar to Pax the two games are really very different. Greenland having much more in common with Bios Megafaua and Origins and more of a “misery simulator”. Hehe! Yes, thanks for that! Out of curiosity, have you had a chance to playtest Pax Pamir? I’m curious whether I should just wait for that one, or find a copy of Pax Porfiriana before the sequel’s release. I don’t know all that much about Pax Pamir actually so can’t really comment. I know Pax Renessaince was put on hold last year after some problems arose during playtest and with Greenland and now Neanderthal taking up Phil’s time (not to mention the ever rumoured High Frontier re-print/revision) Pax Pamir certainly looks to be the next release in the Pax series. It’ll be interesting to see what an “outside” designer does with the mechanics. Many times I’ve thought about what a Phil Eklund game would look like if designed in a more… conventional style, and this might be the answer. Hehe! Isn’t this one fun?! I’ve only gotten one play in so far, but I really like it. Once again you nailed the feel of the game with your review. Excelente! I’m now an Eklund fan. I’m really looking forward to his co-designed Pax Pamir. It really is incredibly fun. If I’d had more time to thoroughly explore it before the end of 2014, it would have easily been in the top five of the year. Maybe even higher. As for Pax Pamir, I’m now in the market for a good overview of The Great Game, a period of history that I’m woefully underread on. Must get ready for its release later this year! First with Polis, then with Sekigahara, and now with Ecklund’s games, i find myself learning more about the historical events to better understand the conflicts played out in the games. It makes for a richer, more rewarding experience for sure. This is quite a change from the many Euros I’ve played which never inspired me to pick up Machiavelli’s Prince to accompany my game play experience. Absolutely. That’s become a running theme of our Friday game nights, actually. For instance, this last weekend we did a couple plays of Fief: France 1429 with all five (!) of its expansions, and we spent quite a bit of time talking about the Avignon Papacy, the Crusades, and the “calamitous” 14th century. Someone remarked that they’d learned more on Friday nights, playing board games and chatting, than across the entirety of their college career. Which is either pretty flattering for certain board games or a heavy indictment of how much attention he paid in college. Let’s hope it was the former instead of the latter. I’m very intrigued by Fief. If you’re playing it now, I assume you’ll have a review of it in the future. That game looks very good. Yes, I second the motion to get your take on Fief. I’m intensely curious about that one. I hope to do a review of Fief sometime in the next week or two. I’m a bit backlogged at the moment, and I wanted to review both the main game and all five of its expansions in one larger writeup, so I have no idea when I’ll feel ready to talk about so much material. Pingback: Valley of Green Mystery Fury (2nd Ed.) | SPACE-BIFF! Pingback: A Great Game about The Great Game | SPACE-BIFF! Pingback: The Great Game Plus | SPACE-BIFF! Pingback: Here I Stand II: Renaissance Gone Wild | SPACE-BIFF!